but differ in the way they capture images. In their core all cameras are really just light-tight black boxes. The working principles they use for creating an image from light are basically the same - light reflecting off the subject enters the camera lens and is focused upside down on the ground glass of a camera obscura or view camera, on the film of a film camera, or on the image sensor in a digital camera. Watch this short video for a visual illustration of how a digital camera works. To play the video press the PLAY button in the player controls. A lens positioned at the correct focusing distance from the film/sensor by a focusing mechanism. In the cheapest cameras the lens are "focus free", meaning the lens is fixed for what the makers regard as the subject distance for average photos and anything that appears nearer than that will not appear sharp. Other lenses have a ring with a scale of distances and operating this focusing control moves the lens slightly further from the film/sensor the nearer your subject distance setting. A shutter which prevents the entered light reaching the film/sensor until you press the release button allowing you to decide exactly when to take the picture. Again in the cheaper camera models the user has no choice of shutter speed, and it is typically set at 1.125 second. In more advanced cameras there is a range of speed settings and having this choice allows to either "freeze" / "blur" moving subjects, or compensate for dim / bright lighting conditions. A lens aperture which controls the brightness of an image. It is an adjustable circular hole positioned within or just behind the lens. Together with the shutter, they allow you to control the total exposure to light your image receives. The aperture also has an important effect on whether parts of scene closer and further away than the subject the lens is focused on also appear sharp. The smaller the aperture, the more parts of the scene appear in focus and the greater the foreground to background sharpness or "depth of field" is. A viewfinder allowing you to aim the camera and preview what part of the scene to include in the picture. There are two types of viewfinders. Non-reflex cameras have a direct viewfinder, which you can recognize by its own separate window above the lens. Single lens reflex (SLR) cameras allow you to look inside the camera itself and view the actual image formed by the lens. Direct viewfinders are bright and clear, but less accurate than SLR for composing images, particularly close-ups. Means to moving to the next picture. 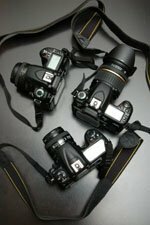 In a digital camera this process involves storing the picture just taken onto the camera's memory card and preparing the shutter for a new exposure. An indicator of how many pictures you have taken. The LCD information panel of your digital camera will display how many images left you can take. This number will vary depending on the size of your memory card and file format/size selected.